About Us | Courses | Programs | Contact | Resources | Articles | Forums | Site Map | Store | Login | Sign Up! Phase comparators are devices that measure the accumulated phase difference between a reference frequency standard and a frequency standard that is being characterized. The advantage of such of a device is that it can be used to continuously compare two frequency standards. Typically these are connected to something like a strip chart recorder or to some sort of monitoring device so that the accumulated phase can recorded over a period of time. This paper will cover the basic use of phase comparators in frequency standard characterization. where f is the frequency of the standard, and f0 is the nominal frequency. This ratio is usually expressed in parts, for instance a good crystal oscillator might have a specification of 1 part in 108 over some timescale. It should be noted that all the phases here are measured in radians. To convert these formulas into ones involving phase in degrees, replace 2� by 360 wherever it occurs. Notice that one can never do any better than the uncertainty of the frequency standard, as expected; but the last two terms decrease in time. This indicates that if one waits long enough, the uncertainty approaches that of the standard. This is not exactly true, as the uncertainty of the standard will in general not be constant over time, and there are other assumptions made here that are not valid over all time scales. This is reasonably accurate though over most lab time scales. Looking at this equation another way, it tells how long one has to measure the accumulated phase change in order to keep the measurement at a certain level of uncertainty. that is the standard must be greater than 4 times better than the spec one is trying to verify. 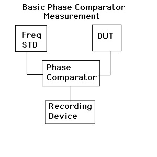 The basic use of phase comparators has been described, along with a basic uncertainty analysis. The minimum time required to record data in order to meet a 4:1 TUR in the measurement was also derived, assuming that the frequency standard is sufficiently accurate. The phase comparator is still in use in many standards labs for the comparison of frequency, although it is older technology. For long-term monitoring of frequency standards it is very useful.